LISTEN NOW! 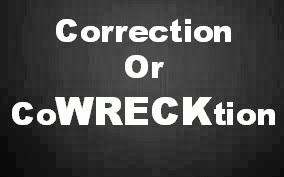 In this abiding moment found in 2 Corinthians 7:8 Pat, Greg, and John discuss the difference between correction and “coWRECKtion”. The word of God shows us in in 2 Corinthians 7:8 “Even if I caused you sorrow by my letter, I do not regret it. Though I did regret it—I see that my letter hurt you, but only for a little while—yet now I am happy, not because you were made sorry, but because your sorrow led you to repentance.” This is the tension between sharing correction with someone and not wanting to hurt anyone in the process. They further discussed the difference of anointed teaching that breaks the yoke in someone’s life as well as the blessing of having a spiritual father or mother who can speak into your life. In fact often times it’s these moments that reveal whether it can be a correctable moment in someone’s life or will it be a coWRECKtion in their life. CoWRECKtion occurs when someone fails to receive guidance into their lives and goes against biblical truths for their life. We are to consider hardships as discipline for God is treating us as sons. We become ready to serve God and his church when we have allowed God to bring us necessary correction in our lives so that we are disqualified in ministering to others.